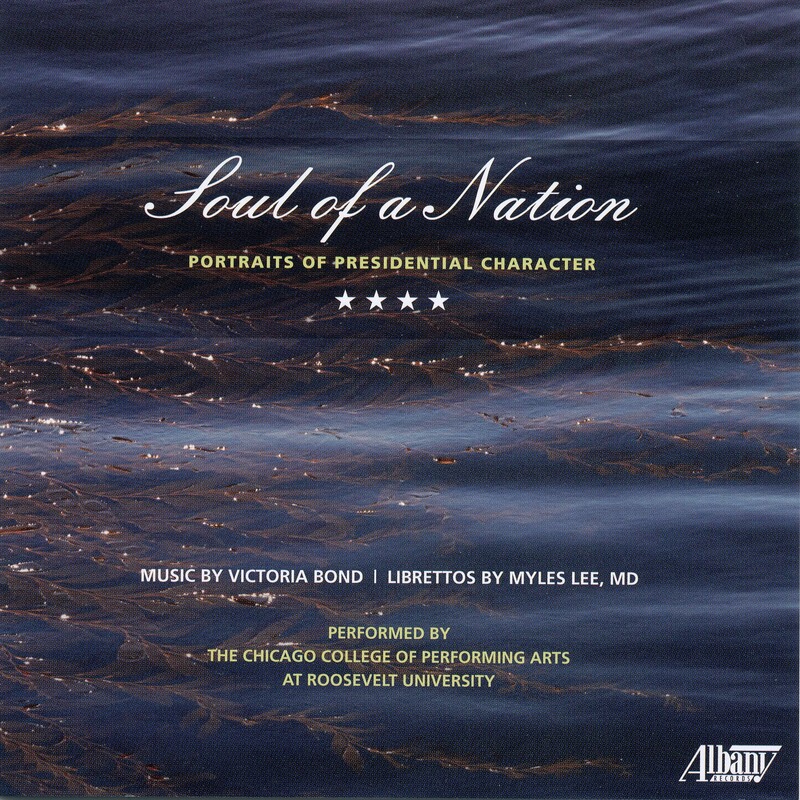 The composer Victoria Bond honors some of our country's greatest leaders in her CD of concertos, "Soul of a Nation: Portraits of Presidential Character". Released on Albany Records (TROY 1723) on May 1, 2018, the CD features soloists from the Chicago and Milwaukee Symphony Orchestras. They are accompanied by the Chicago College of Performing Arts Wind Ensemble conducted by Stephen Squires, and the Roosevelt University Chamber Orchestra under the baton of Emanuele Andrizzi. In these compositions, Bond incorporates musical quotations drawn from the time and life of each president. Pater Patriae uses fife and drum tunes from George Washington's time; The Indispensable Man features big band music from the era of Franklin Delano Roosevelt's presidency, Soul of a Nation includes music by Corelli that Thomas Jefferson kept in his personal library, and The Crowded Hours weaves in popular melodies from Theodore Roosevelt's time, such as "Take Me Out To the Ball Game". In the words of Dr. Lee, "Each piece focuses on a single aspect of each man's character - Washington's moral clarity and prescience; Jefferson as a reluctant warrior; Theodore Roosevelt's exuberant, ultimately destructive, drive; and Franklin Roosevelt's indomitable courage - to illustrate not just their accomplishments, but the inner turmoil each man faced on his journey to immortality." "Soul of a Nation: Portraits of Presidential Character" (TROY 1723) is released on May 1, 2018, and is available on Amazon and other digital and physical outlets. Contact Gail Wein at classicalcommunications@gmail.com for media review copies. Newer PostTransCentury Communications reviews "Soul of a Nation"